Developers at M3D have created a four filament 3D printing head aptly named the QuadFusion witches this week launched via Kickstarter to raise the $10,000 required to take the design into production. The QuadFusion 3D printing head is the first four filament mixing extruder, allowing you to mix both colours and materials to expand your creativity even further. Watch the demonstration video below to learn more about the QuadFusion 3D printing head which is now available to back via Kickstarter with early bird pledges available from $159. 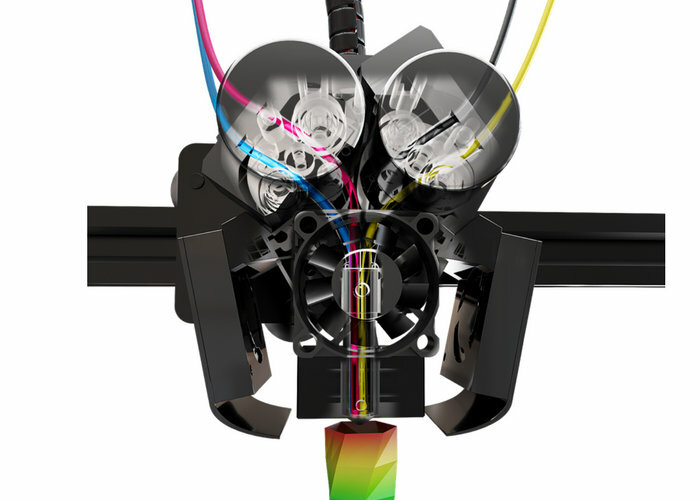 The 3D printing head is capable of combining Cyan, Magenta, Yellow & Key (CMYK) filaments allowing you to print over 50,000 unique colours. Or if you prefer combining Black, White, or Transparent 3D printing filaments allowing you to create lighter and darker shades using the black-and-white and also the degree of transparency if required. For more information on the QuadFusion 3D printing head jump over to the official crowdfunding campaign page for full specifications and a list of all available pledges which will start shipping out to backers during Q3 and Q4 2018.